Copyright 2011 "Ashiya Cosmopolitan Association" All rights reserved. 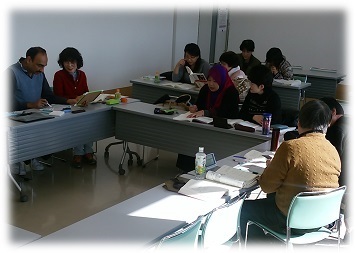 The main aim of ACA Japanese lessons is to learn basic level Japanese for living in Ashiya and improve their ability of conversation, reading, comprehension and kanji . Please click here if you are interested in Japnese lessons for children. Lessons are not held in August, on national holidays, and at the end of the year and the New year. Students who participate in Tuesday morning lessons held in North area need to pay 2,000yen for room expenses every fiscal year(April through March).